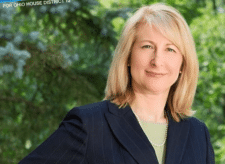 Former Pepper Pike City Councilwoman Jill Miller Zimon has received the Ohio Democratic Party Endorsement in her State Representative race. Zimon faces sitting incumbent Democrat John E. Barnes Jr. in the May 6th primary for House District 12 which encompasses Bedford, Bedford Heights, Cleveland Ward 1, Maple Heights, Mayfield Heights, Highland Hills, North Randall, Orange Village, Pepper Pike, and Warrensville Heights. Zimon, a lawyer, social worker, and journalist/blogger, has said she decided to run for this office because House District 12 deserves a representative who will be a strong voice in Columbus on behalf of women, seniors, voters, education and economic development. “With a Republican supermajority of 60 seats in the State House, the constituents represented by those lawmakers never have to fear that they will be ignored or disregarded. That is why it is up to us in the minority party to act as a constant check and balance on the majority party so that issues such as health care for all, women’s reproductive rights, voting rights, and more don’t get swept aside,” Zimon said. In addition to the ODP’s action, Zimon was also endorsed late last week by the Stonewall Democrats, IUPAT District Council 6, Painters Local 841, Women’s Campaign Fund, and Bedford Mayor Stanley Koci.